Famous people born on January 4th are up-front and meticulous. But at the same time, they can be a deceitful goat. Being the impatient Capricorn can lead the famous people born on 4 January astray and down the wrong path. It may be better to walk away sometimes than it is to stand their ground. They love a challenge and generally, it shows in the people who are attracted to them. They are not your ordinary folks. Luckily for famous January 4 birthdays, the strong points outweigh the bad. They have the ability to make money hand over foot. Their originality usually provides them with a progressive ending to business dealings and to relationship status. If you are a famous January 4 birthday personality, in spite of yourself, people tend to attach themselves to you and want to be a part of your life. When it comes to your possessions, they are not stuck on brand names or material things but it may be wise to save some money. If they blow their money as fast as they make it, it may not be any available for hard times. 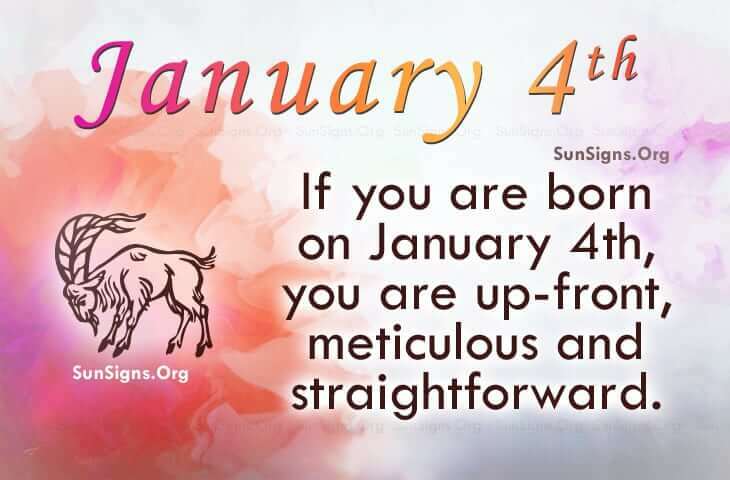 Famous people with a birthday on the January 4th are Capricorns who are straightforward and rebellious. The restless individual born on this day can be reckless. Be careful… the consequences could change your life.